In today’s episode we are starting from scratch. We are rolling back the clocks and going right back to the beginning. I’m often asked if I could go back in time and start my health business over again – what would I focus on? And you know what? The things I would focus on THEN… are the same things I focus on now. 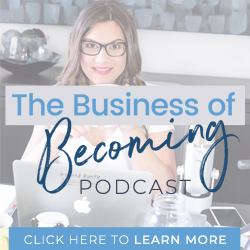 It doesn’t matter if you are a total business newbie or a seasoned veteran – this episode is a starting guide or a benchmark to make sure you are focusing on the right things in your health business! There is a companion guide with worksheets so make sure to download them at the link at the bottom of the page! I am going to take this episode from the vantage point that you’ve just graduated – whether that is from Naturopathic College, your personal training certification or Reiki Level one. CONGRATULATIONS! You are officially a CEO! Your diploma or certification still has that fresh paper smell and you are raring to go except you have no clue where you should actually start. What about all of the social media pages? Do you need to do YouTube videos? Funnel? What’s a funnel anyways? Your mind is running a mile a minute with too many ideas, not enough support or direction and you feel so much fear that none of this will work out like you’ve planned that it’s sometimes hard to breathe… Oh ya, I know those feelings well. I’m not going to tell you NOT to worry because that’s not helpful… just know that I’ve got you. I created this podcast episode to give you the 7 key areas to focus on when you are just starting out online so that you can actually make progress, make some money and feel really good about yourself. Are you just starting out in your business? Were any of the 7 areas to focus on I talked about NEW for you? Pop it below or visit me on Instagram (my current social platform of choice) and send me a message there to let me know what you want to hear more about. Loved it! Thanks for sharing you are an intuitive empath and use that with your ICA. I am as well and haven’t thought about using it in that way. Your Facebook group has been super helpful as well with giving me feedback. Thanks! Thanks so much for taking the time to comment Tracy. So glad you enjoyed this episode. It’s so fun hanging out in the Facebook group with everyone. See you in there!